Mens Grey Distressed Jeans Graffiti. Be seen in legendary denim in these mens grey distressed jeans by Red Bridge. Featuring dark grey stonewashed jeans with black and white graffiti graphics on front. Constructed with four-button fly, belt loops, and five-pocket design. Mens grey distressed jeans designed with thigh whiskering, distressed markings, and frayed applique lined with dark embroidery. Includes single horizontal pleat at the knees. 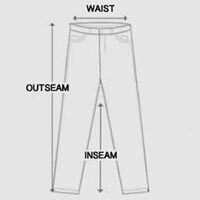 Mid-rise jeans made from heavyweight cotton-blend with slight stretch. Get noticed in trendy grey distressed jeans with an urban attitude. Model is wearing size 31. For accurate measurements, check the table below. Great motto on graffiti that reflects my attitude and way of living. Got a lots of attention and complements while wearing them, even for work! Thanks a lot for great stuff, Differio, i became repeat buyer myself! Unique design and the wash is fantastic, gives it beautiful dirty effect.